The first step in the certification process is the completion of the PADI eLearning course. PADI's on line class consist of 6 sections and is completed at the students own pace. 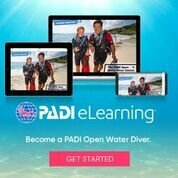 Online PADI courses allow you to complete this portion of the PADI requirement for certification as an Open Water Diver in the comfort of your own home. It addresses all types of learner with its approach, text, spoken words and video guide you through the academics and all students complete both the knowledge reviews, quizzes and the final exam thru the PADI eLearning course. Just click on the eLearning link below to pay for and begin this exciting, informative and required element to the full certification process. If you have already paid for eLearning you can click the link below and then follow the SIGN IN HERE link.